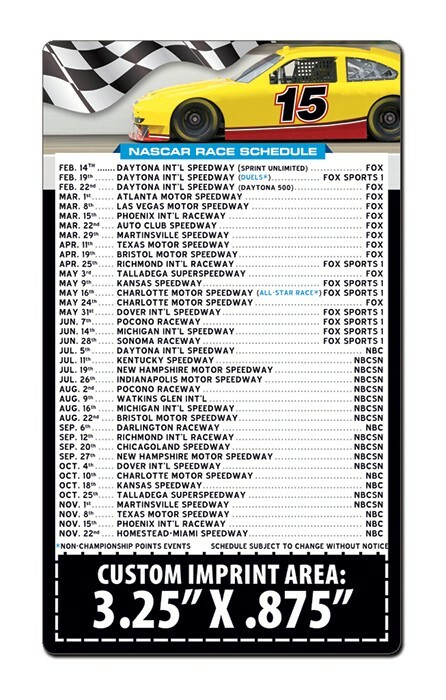 NASCAR Racing Schedule Stickers / Decals are sure to draw attention and get your message across.... indoors or outdoors. These 4 x 6 rectangle shape with square corners vinyl stickers, decals, labels come cut to size and ready to be handed out. They are very durable and printed in beautiful full-color (four color process). They are very easy to remove. They can be stuck on any smooth surface and removed without any damage... showcase your team spirit all season long. 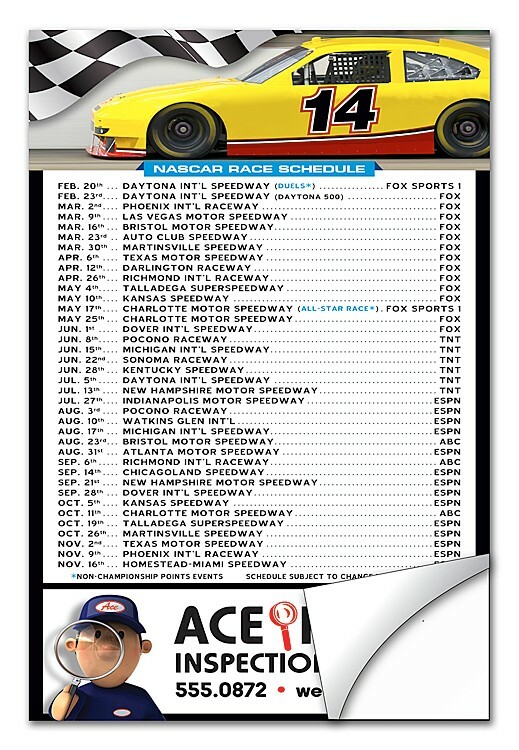 Magnet Sport Schedules - 4x7 NASCAR Round Corners - 25 mil. 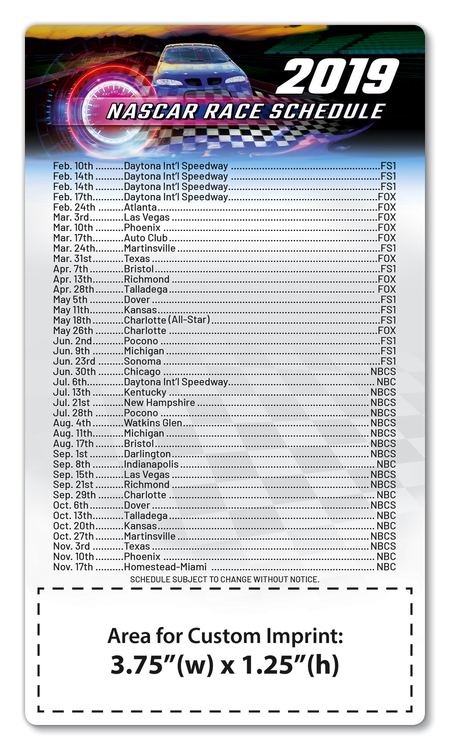 AVAILABLE TO SHIP IN JANUARY PROMOTE YOUR BUSINESS WITH PEOPLE THAT LOVE NASCAR! 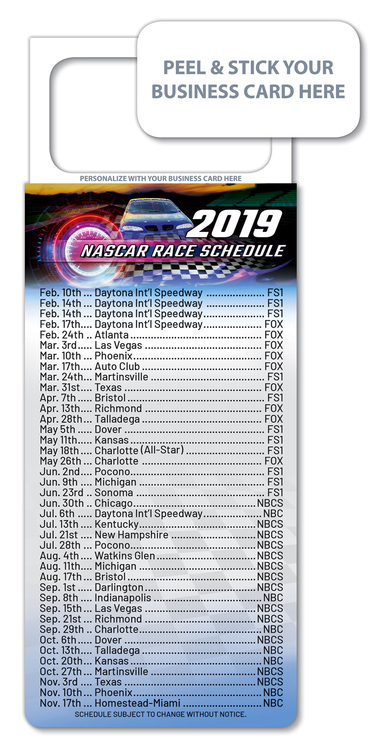 Available with the current professional stock car racing schedule, you can have an imprinted gift item for trade shows and sales meetings, or use for sales calls and prospecting. Rectangle Magnets make a beautiful product to give to your customers. These magnets are printed in full-color and are a sturdy 25 mil. thick. The 4x7 size makes a big impression that will last. AVAILABLE TO SHIP IN JANUARY PROMOTE YOUR BUSINESS WITH PEOPLE THAT LOVE NASCAR! 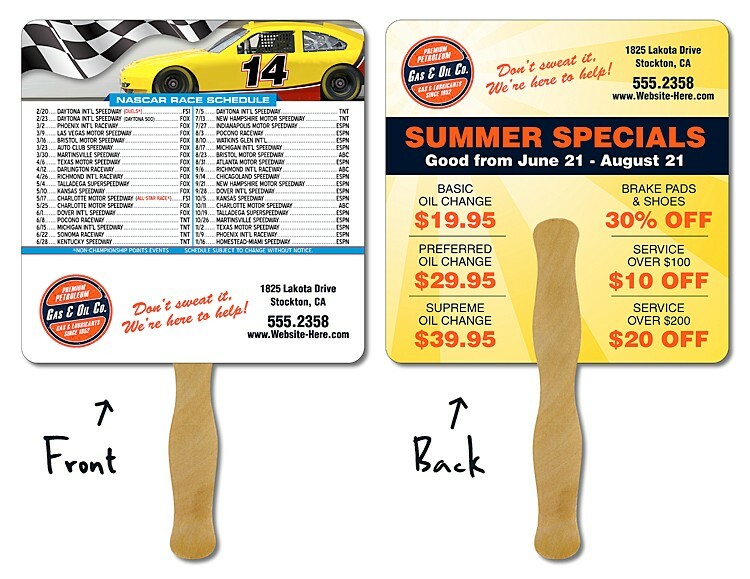 Available with the current professional stock car racing schedule, you can have an imprinted gift item for trade shows and sales meetings, or use for sales calls and prospecting. Rectangle Magnets make a beautiful product to give to your customers. These magnets are printed in full-color and are a sturdy 25 mil. thick. The 3.5x4 size makes a big impression that will last. AVAILABLE TO SHIP IN JANUARY PROMOTE YOUR BUSINESS WITH PEOPLE THAT LOVE NASCAR! 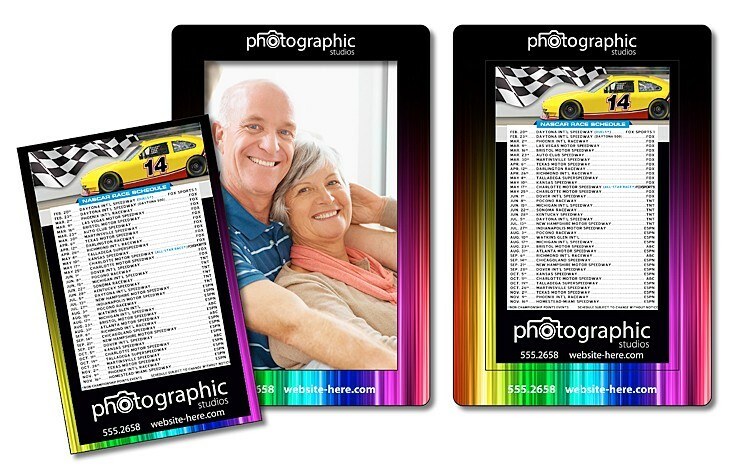 Available with the current professional stock car racing schedule, you can have an imprinted gift item for trade shows and sales meetings, or use for sales calls and prospecting. Rectangle Magnets make a beautiful product to give to your customers. These magnets are printed in full-color and are a sturdy 25 mil. thick. The 3.5x6 size makes a big impression that will last. 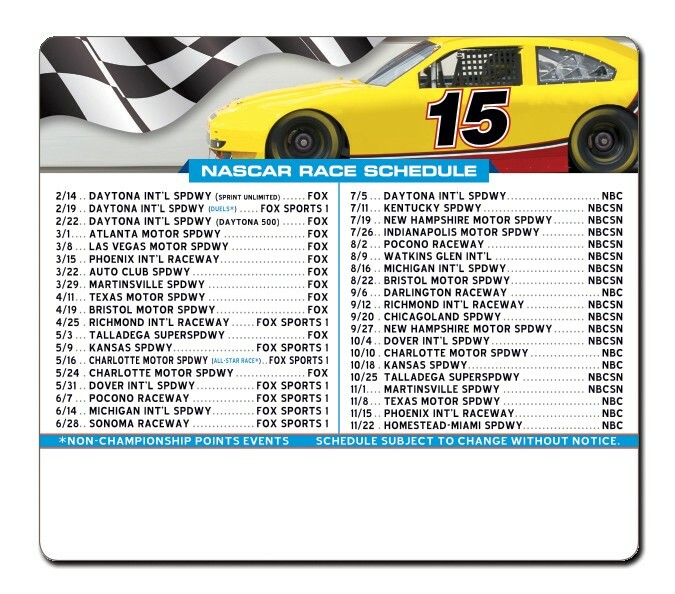 NASCAR Schedule Hand Fan - 8x8 Square (Round Corners) Laminated - 14 pt.